What is a Write-in Candidate ? A write-in candidate is a candidate in an election whose name does not appear on the ballot, but for whom voters may vote nonetheless by writing in the person's name. Write-in votes are votes cast for a person or persons whose name(s) do not appear on the official ballot, but can just as equally be voted into office. The system is almost totally confined to elections in the United States, and famous persons have won the election by write-in, including Herbert Hoover, Franklin Delano Roosevelt, and Dwight D. Eisenhower. In New York, a write-in vote may be cast by the use of a name stamp or a pen. A write-in vote must be cast in the appropriate place on the machine, or it shall be void and not counted. A voter need not write in the first and last name of a candidate in every situation; the standard is whether the election inspectors can reasonably determine the intent of the voter when they cast their ballot. To vote for a person whose name is not printed on this ballot write or stamp his or her name in the space labeled "write-in" that appears (insert at the bottom of the column, the end of the row or at the bottom of the candidate names, as applicable) for such office (and, if required by the voting system in use at such election, the instructions may also include "and fill in the (insert oval or square, as applicable) corresponding with the write-in space in which you have written in a name"). 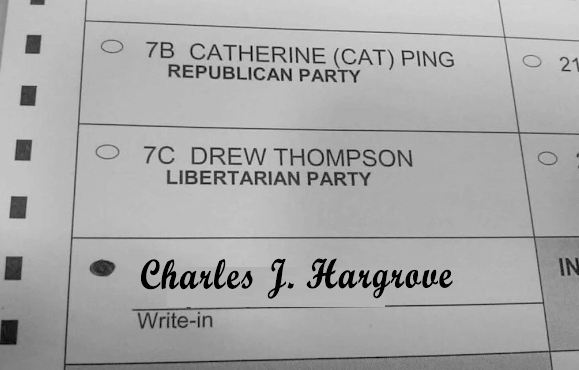 Charles J. Hargrove is a write-in Candidate for US Congress, and is in compliance with New York State 'Election Law' (L.1976, Cg. 233, Sec. 1-104) & Title III. Sec. 8-308.